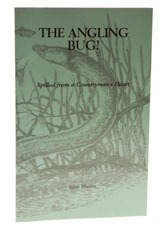 John Martin - The Angling Bug! Well up to the standard of the angling poetry that we are used to receiving at the Waterlog office, The Angling Bug! is subtitled 'Spilled from a Countryman's Heart.' Perhaps the best way of giving you a flavour of the contents of this slim paperback is to share one of John's poems with you. I have chosen 'The Mystery of Redmire Pool'. The real name is Bernithan Pool - you can believe me - it's true!